Photo report by Dave O'Brien from the Westfield International Airshow and Barnes ANGB Open House hosted by the 104th Fighter Wing. 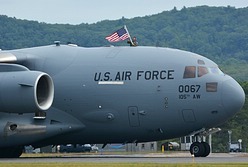 Seven years have passed since the 104th Fighter Wing at Barnes Air National Guard Base and the Westfield-Barnes Regional Airport hosted the Westfield International Airshow 2010. The air show finally returned this year, celebrating a century of American airpower and the U.S Air Force’s 70th anniversary. The 104th Fighter Wing’s 131st Fighter Squadron of the MA Air National Guard also celebrated its 70th anniversary this year. Organized at Barnes Airport from the wartime 333rd Fighter Squadron, the 131st FS as part of the Massachusetts Air National Guard was extended federal recognition on 24 February 1947. The Westfield International Airshow 2017 was held over the weekend of August 12-13, with the practice day on Friday being accessible to the media and DOD members and their families. Weather for this weekend started tough, on Friday and Saturday, the two days I attended, it was very humid and muggy with light winds and flying in and out of clouds. Combined with the smoke most of these acts use, it made photography very difficult. If you attended on Sunday you were treated to the best day with blue skies. 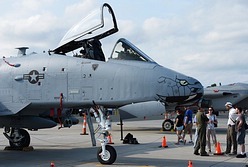 The show opened on Saturday with two F-15s from the 104th FW and two A-10s from the 122nd FW of the Indiana ANG. 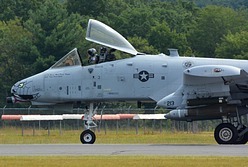 The Warthog had been a long-time resident of Barnes when the A-10 equipped the 104th FW / 131st FS. 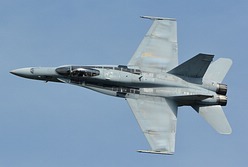 The unit transitioned to the F-15 back towards the end of 2007. Third Strike Wingwalking with Carol Pilon out on the wings followed the fighters. 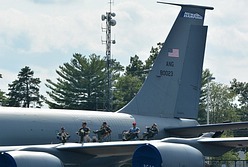 A C-17 of the 105th AW from Stewart ANGB performed a sweet demo. It always amazes me how tight a plane so large can turn. It sometimes acts like a fighter up there, as it banks to do a 360 at mid field. The P-51 “Quick Silver” and aircraft from the National Warplane Museum went up next. They included C-47 “Whiskey 7” which made static line paratrooper drops to mimic the D-Day drops made at Normandy in 1944. The P-40 Warhawk, F4U Corsair and a B-25 took command of the sky, so the C-47 could come and make a safe drop. Greg Colyer took up his T-33 “Ace Maker II” and was followed by the US Navy TAC Demo by VFA-106, which used the F/A-18C 'Legacy' Hornet. The Trojan Horsemen performing their AT-28 tactical demo was next in the show, the six beautifully restored T-28 Trojan aircraft in varied military color schemes flew tight formations. The next display slot was appropriately reserved for the A-1E Skyraider of the Collings Foundation. The sun started to come out and the clouds broke enough that the Black Daggers Special Ops parachute team could finally jump with the American Flag. They were followed up by aerobatics by the Geico Skytypers, Jason Flood, Matt Chapman, and Michael Goulian. Closing out the show was the USAF Thunderbirds performance. It had been five years since I last photographed the Thunderbirds. I really wish the clouds and wind would have helped more on Saturday. They put on a great show, I hope to catch them again soon in better weather. I would like to thank the huge hospitality of the 104th PA unit for the great media day. I look forward to the next Westfield International Airshow because of the way this show was run. The changes to the media day really made the day be the best time I have ever had on a media day. From the ease of signing in on Friday, to getting on the ramp to get to be ready for the practices. The huge media pit right in between the large tents provided ample space and with the hot ramp far to the left, the view was unobstructed. It was such a nice change. Because of welcoming DOD members and their families on the practice day, most of the vendors were open on Friday, also enabling the media folks to actually grab food and drinks throughout the day. It was also possible to walk the ramp along with the DOD families, this again beats other media days where you’re trapped in a small media pit for the entire day.